Note Songs: I'm So Thrilled!! Awards and a Diva! Attention! Attention!! Oh, Browsing Ones, we must interrupt this posting of 'thank yous' and awards to bring you the latest breaking news!! We are always on top of the Breaking Bathroom Business News and you can count on us to bring it to you FIRST! Okay, Questioning Ones, we've just found out another Bathroom attack! Another invasion! What is Blogland to do? Send in the Diva of Bathroom Business ~ me! Here I am with toilet brush in hand and I will do my inspection of this lovely one now! I'm never too busy for my Bathroom Business. Well, Pondering Ones, I sort of see a gorgeous face and I'm sure if I could see it, it would possess the most peaches and creamyness of complexions. I'm sure there are two gorgeous eyes, we can only imagine, Dear Ones! I do see the most gorgeous of locks just filled with bathroom hightlights - now this is a very good sign, Marveling Ones! Now I don't see any slender arms, but I do see the most daintiest hands with the creamiest of fingers attached to a CAMERA!! Yes, yes!! We have another Bathroom Diva! Do we know this most gorgeous one? Well, I'm peeking around the camera to see her face and yes, yes, this is our own Connie, I do call her Connieness, at http://connie-livingbeautifully.blogspot.com/. Oh, Dear Peeping Ones,this is the sweet little chickee you've ever seen. She is all romantic in her home and has a Love Bunny!! Woo Hoo!! Okay, I'll get into my Bathroom mood, please...my robe, my crown, would you please pick my toilet brush up off the floor? Ahem...Dear Connieness, I am about to crown you with the most sought after title in the world...you are now a Daring Darling Bathroom Beauty Snapping Diva and will be one for ever and ever and until the twelfth of never. Now go, Connieness, and show your gorgeous face to bathrooms ever where. Snap, Dear Camera In Hand Ones, snap!! I've just got to share with you another beautiful award I have just received from Jan and Mr. Tom at http://jt-jantom.blogspot.com/. Jan has been such a faithful follower of my blog and comments almost every day! 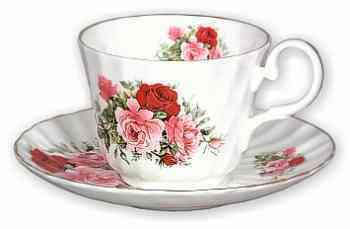 Her love of all things romantic is evident on her blog - roses, tea parties. Her faith is ever so strong and she shares that without fear. The first and only giveaway I've won came from her!! I truly consider her a friend! Jan and Mr. Tom, thank you from the bottom of my heart for this beautiful award. You know I am playing that piano!! You Are Music To My Heart! Isn't it just the most beautiful thing? Thank you, Dear Ones. I'm so thrilled and flattered that I've received another award!! Twice! Just look at this little gem of goldenness!! Kathi at http://lavenderlaceandthyme.blogspot.com/has and Judi at http://judicreations.wordpress.com/ awarded me with this greatness - Blogging Friends Forever! Isn't that just the sweetest? These sweet Ones are both such a joy. I truly appreciate this, Dea Ones, from the bottom of my heart! I feel so blessed to have these two lovely ladies as my BFFs!! 1. Buffie at http://buffiesblaaaahg.blogspot.com/. This pretty one is so funny and she shares the every day happenings of her life - and her life is hilarious, or that's the way she tells it anyway!! But somehow she manages to stay the beautiful one. 2. Pat at http://backporchmusings.blogspot.com/. This lovely gracious lady is a fantastic photographer and shares the most beautiful pictures. She loves her home and travels quite a bit and takes us with her. 3. Darlene at http://darlenesdays-darlene.blogspot.com/. Darlene is a jewel. She has a great sense of humor, loves her family (she has the most adorable little girl, Lexi), her home and is quite the creative one. 4. Carol at http://charliandme.blogspot.com/. This wonderful one loves history, nature and has a little side kick, Charli - an adorable little mini Schnauzer, like Chloe Dawn. Charli is a Daring Darling Bathroom Beauty Snapper, too! 5. Lynne at http://lynnesgiftsfromtheheart.blogspot.com/. This beautiful one is new to Blogland. She is an old time friend from Rate My Space and a new follower to my blog as I am to hers. Now Lynne has the most wonderful shop with treasures we can all drool over. Her home is her castle and she decorates it beautifully. She is very sweet and humble. Go visit her and tell her I sent you! I'm sure she'll give you some tea from one of her antique tea cups. Oh, Dearest Ones, I hope you don't skip over these kinds of posts! This is a way to congratulate each other and meet new friends! I cherish you all and really do value our Blogland friendship!! Thank you so much Shelia for saying such kind things about me!!!! Congratulations on your award! Congrats on your award, who doesn't like a gold card. I love your new background, it's fun. Two awards even..good for you! I have really enjoyed reading your posts and having you come visit me too. I'm so glad you found me this summer when you first posted on your ice cream recipe that you use on your ice cream machine after I posted on buying one. Funny how that has stuck in my mind. I hope you have a very lovely day...and I'll be drawing my 200th giveaway today. Congratulations on your well deserved award!! :) I love that song, too. Have a super day! Hi Shelia, me again. I went to my guestbook to see if I could put the correct town in, and I don't see you in the guestbook, maybe when you get time you can redo it. You listed a few blogs that I haven't visited before...I'm off now to go take a peek and say hi! How right you are! Thank you for your precious words, I am blushing :). What a wonderful southern lady you are! Congratulations! You are very deserving of this award - you make so many people happy with your cheerful and creative blogs!! Another congratulations to you, Shelia, my Most Deserving Diva One. I'm going to that other place now. See ya! yay! good for you and a big Congrats coming your way.Enjoy your day! Congrats! Well deserved. Hope you have a great day today. Congratulations on your award, and congratulations to the new recipients. We all love you, Shelia. Congratulations on your award! and I LOVE that song. I will be humming it all day now. But then I'm a succor for Celine Dion. I thought I left a message already today!!! It said, congratulations on your awards and on the MUSIC...Somewhere in Time!!!! Obviously, you've figured out that that song/movie is my FAVORITE!!! I can't wait for the SIT Party!!! I have something for you on my Blog that you need to stop by and accept!! We're honored to call you friend, Shelia! And, we're happy that you like the award. Congratulations on your awards, they are well deserved. I enjoy my visits every day to see what you've been up to! Congratulations on your sweet awards! Your blog is one of my favorites and I look forward to each day's post. Congrats on your awards sweetie and that bathroom Diva is a hoot! lol Thanks for coming by and I hope this has been a great day for you! Of course you get all the awards, everyone loves you, Shelia! I loved the "music" award...and you so deserve it!!!!!! Congratulations you deserve the awards. You are so much fun and full of life. Your personality shines through your words! Thanks for making it fun and thanks for sharing all these wonderful blogs with us. My most heartfelt congratulations on your awards. You bring so much happiness to people who read your blog. You deserve every one of your awards and MORE! Hello dear Sheila. Congrats to our new bathroom Diva. Lol how did you know who she is???? Congrats on your awards. They are the perfect awards for you and your blog. I have to say I love your blog and the fun you have with blogging. You make me smile every time I visit. Thanks for your sweet comments on my Molly Rose. Someday you will have some and oh, how much you will love them. Congratulations, Sheila!! You are so VERY deserving of these awareds. I hope you're having a good week. Hi, Sheila girl...I love your awards and I can see you love them. too. Congratulations!!! Congrats on the award Sheila. You are great girl ! the music on your blog is sooooo soothing i'm finding it hard to leave. Sooooooooo happy to see your smiling face!!! !